In this section of the site, each pictorial scene presented in the upper banner was taken from Claude Picard’s historical fresco. It is possible to research each of the twenty-four scenes comprising this fresco by clicking on the images or arrows located under the banner. Each scene is accompanied by an explanatory text in the center of the Web page. The French version of these texts is drawn from a special edition, in April 1989, of the Revue de la Société historique du Madawaska entitled, “La vie au Madawaska 1785-1985: fresque historique de Claude Picard” (PDF copy). Inspired by the different scenes in Claude Picard’s historical fresco, the texts in the periodical deal with life in Madawaska from 1785 to 1985 and have been translated to English. To make the fresco more detailed and alive, interactive multimedia learning objects were added to the site. The latter provide explanations, enrichment or additional content in keeping with certain features linked to the topic addressed in each scene. 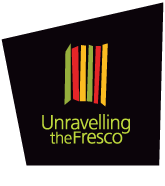 So the explanatory text linked to each scene, presented in the centre of the page, contains hyperlinks which make it possible for users to enrich his knowledge of the history and heritage of the area, beginning with the subjects touched upon in the fresco. In 1985, on the occasion of celebrations for the Madawaska Bicentennial (1785-1985), the city of Edmundston commissioned Claude Picard, a distinguished Madawaska artist, to create a pictorial work of art which would illustrate the two hundred years of history of the area. This work took the shape of a mural fresco entitled La vie au Madawaska 1785-1985 which told of life in Madawaska from 1785 to 1985 in twenty-four historical scenes or vignettes. 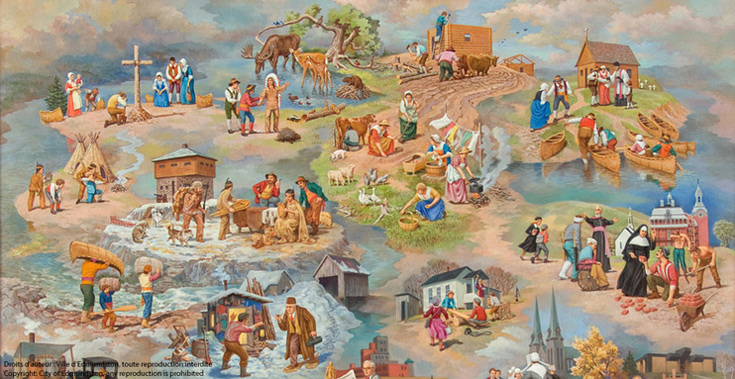 This mural measuring approximately 2.1 m X 2.3 m (7' X 7 1/2'), is exhibited permanently in the Edmundston Municipal Council Chamber. In this fresco, the artist wanted to pay “homage to our pioneers, our settlers, our missionaries, our builders”. The work “defines the altruism, sacrifice, courage, tenacity, loyalty and devotion to work of our ancestors. It is a brief retelling of the history of Madawaska, but this time through images”. In fact, Mr. Picard was inspired by Father Thomas Albert’s book, Histoire du Madawaska, and articles published in the periodical published by the Société historique du Madawaska to create and achieve this tableau. Claude Picard’s historical mural (fresco) is explained in detail in the section “General Information” of the Web site.